PayPal is now a global leader in online payment solutions and is a worldwide acceptance way of online payment. It lets you use funds from your credit card (e.g Visa , Mastercard , American Express, JCB Card ...) ; and you can use it with confidence: Your transactions are protected by PayPal's sophisticated fraud prevention system. All you need is a PayPal account to get started. Don't have one yet? It's fast and easy to set up; in fact, you can do it while you complete your purchase from our shop. Please deposit the total amount according to the following details and then mark the order number on the Deposit Slip and fax to (852) 27807742 or e-mail to eShop@pertec.com.hk**. 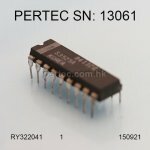 Merchant Name: PERTEC ELECTRONICS CO.,LTD. Address : 618 Nathan road, Mong Kok, Hong Kong. Please pay the exact amount of your order in US Dollars to the following bank account. Customers are responsible for any telegraphic transfer and bank transaction fees. Remittance must be free from any commission charges by the bank. Address: 618 NATHAN ROAD, MONG KOK, HONG KONG. the order will be cancelled and we will inform you by email.